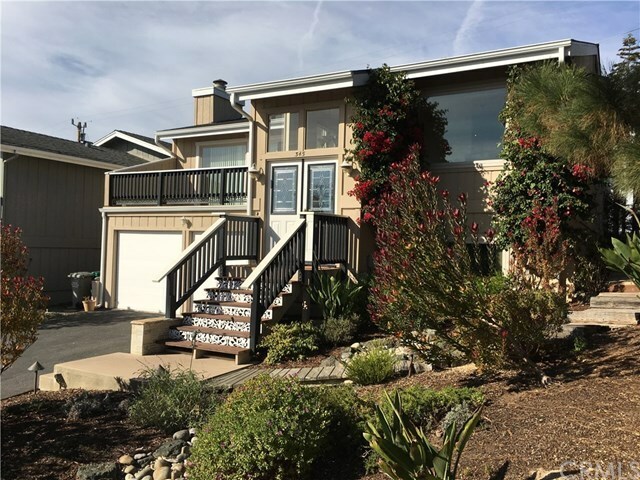 Enjoy sparkling white-water views of Moonstone Beach and spectacular sunsets from this lovely 3 bedroom 2 bath home that is located on a quiet Happy Hill Street. Pretty landscaping welcomes you as you enter the foyer of this comfortable split level home. On the upper level, you will enjoy panoramic ocean views from the spacious living room & large ocean view deck. The living room has a vaulted ceiling and a wood-burning fireplace. The roomy kitchen, which has a garden window, breakfast bar and open view to living room flows into a charming dining area. The master bedroom & full bath are en suite, and the bathroom has a separate shower and tub. You can reach the pretty backyard area from the sliding door & small deck off the master bedroom. Second bedroom is also located on this level. Third bedroom and a second full bathroom are on downstairs level, which is a perfect guest room or office, music room or quiet space. The newer washer and dryer are also located on this level along with entry to the 2 car attached garage. The interior of the home has been freshly painted and handsome new floors have been installed throughout. New roof, furnace, dual pane windows and exterior doors have been added in the last 5 years. Great location & just a short walk to Moonstone Beach and Cambriaâs West Village. This is the first time this home has been on the market. It is a must see!